David Art is Associate Professor of Political Science at Tufts University. Hrag Vartanian is editor-in-chief and co-founder of Hyperallergic, a publication he created in 2009 in response to the Heidi Beirich is the Intelligence Project Director at the Southern Poverty Law Center. Jolyon Howorth is the Jean Monnet Professor of European Politics at the University of Bath in the UK, and a Visiting Professor at Yale University. 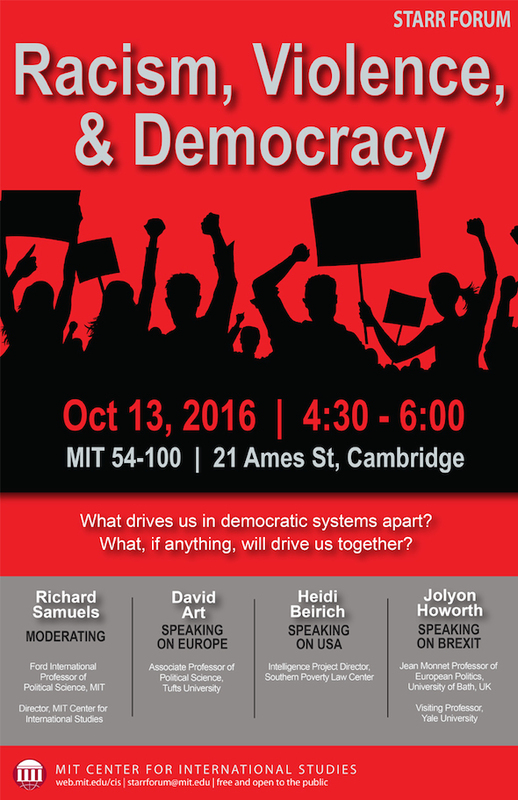 Richard Samuels is the Ford International Professor of Political Science at MIT and the Director of the MIT Center for International Studies. This event is sponsored by the Center for International Studies at MIT SHASS.